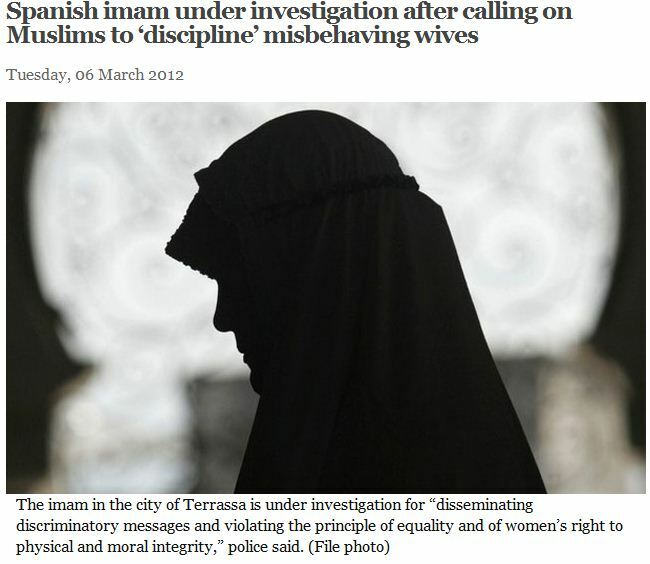 SPANISH IMAM UNDER INVESTIGATION FOR CALLING FOR VIOLENCE AGAINST WOMEN……. – The Tundra Tabloids……. SPANISH IMAM UNDER INVESTIGATION FOR CALLING FOR VIOLENCE AGAINST WOMEN……. Qur’an (38:44) – “And take in your hand a green branch and beat her with it, and do … towards their husbands, he (the Prophet) gave permission to beat them. Previous Post Previous Post COPT PRIEST SENTENCED BY EGYPTIAN COURT TO SIX MONTHS IN JAIL FOR EXCESSIVE CHURCH HEIGHT……..
Next Post Next Post FINNS PARTY MP WANTS TO BAN MALE CIRCUMCISION IN FINLAND……..